Illustrations and text on inside covers. Silver award winner in the MadeForMums Awards 2017 children's books series category. DKfindout! Science teaches kids everything they would want to know about the exciting world of science. With beautiful photography, lively illustrations, and key curriculum information, the DKfindout! series will satisfy any child who is eager to learn and acquire facts - and keep them coming back for more!For any child that can't get enough science, DKfindout! 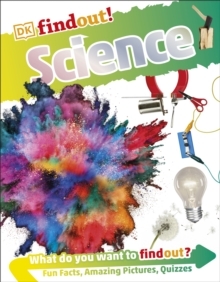 Science is packed with fun facts, quizzes, amazing photography and key curriculum text introducing all the key topics for age 6+ readers covering everything from light and electricity, to animals and parts of the body. Discover how to make a rainbow and all about the states of matter. DKfindout! Science will spark the imagination of children while providing inspiration for science fair projects.